It all started in Ecuador. Tyler and I were each on our 5th bomber of Ecuadorian Pilsener (think PBR, but cheaper) when a buddy from the States messaged and said, “Hey, do you want to run Rim-to-Rim-to-Rim this spring?” Many a great decisions have been influenced by beer, and this would be one of them. It wouldn’t be the first time we traversed Rim-to-Rim-to-Rim, and it also wouldn’t be the first time that beer would lead us into the great hole in the ground. 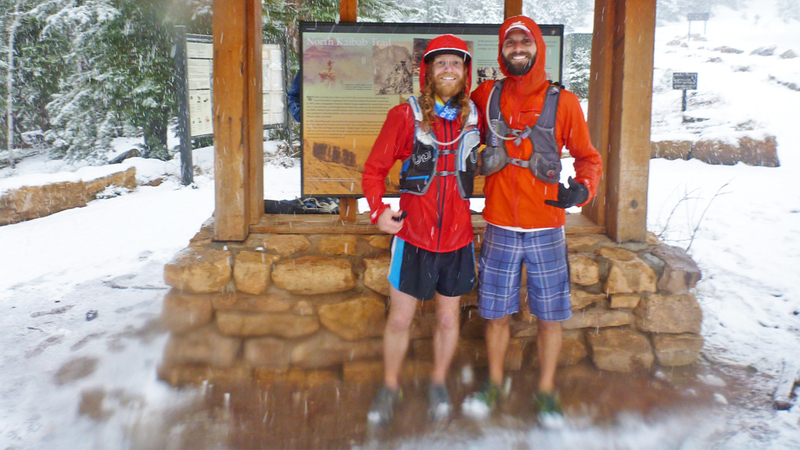 Check out my blog post about our first Grand Canyon Run and note that it opens with “It started with a mug of Pale Ale at Figueroa Mountain Brewing, as most good ideas do…” Well, here we go again. A few months later I returned from South America to vagabond North America in my van. Our R2R2R weekend happened to fall on the same weekend that most of our Born To Run tribe would be doing the same. A whole host of dirtbags, ultrarunners, and beer drinkers descended on one of America’s best National Parks. ¡Fiesta! We commandeered almost an entire loop of campsites and the festivities began. Campfires, shake out runs, and jam sessions climaxed in the traditional beer mile, of which, most participants would prefer to skip. But alas, tradition is tradition, and we all toed the line of a 1/8 mile out and back course with 4 beers each. 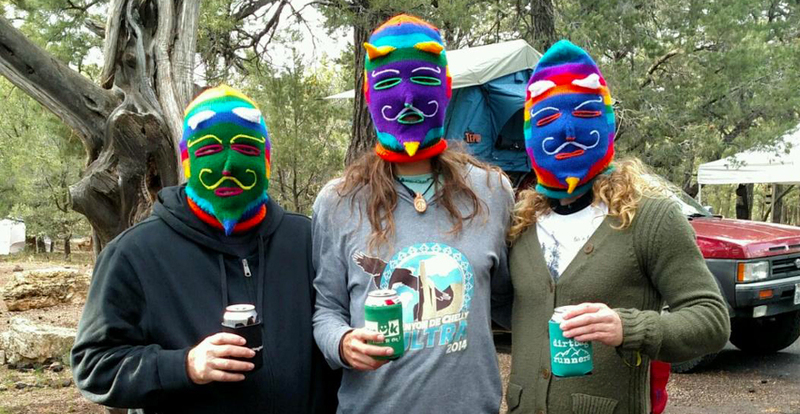 To celebrate Tyler’s 30th birthday I brought back Peruvian Mustache Masks for me, Tyler and Dad. Important note, it’s hard to drink a beer through a Peruvian Mustache Mask. Most of the rest of the evening is a blur, as it normally is, but we ate dinner, haphazardly prepared our gear, and zipped into sleeping bags shortly after dusk to be ready to run in the morning. Our alarms rang just after 3:00 AM and the dark, chilly air was a foreshadowing what was to come. We guzzled our coffee, grounds and all, and scarfed down oatmeal before stuffing our packs with candy bars and climbing into the truck to start our adventure. 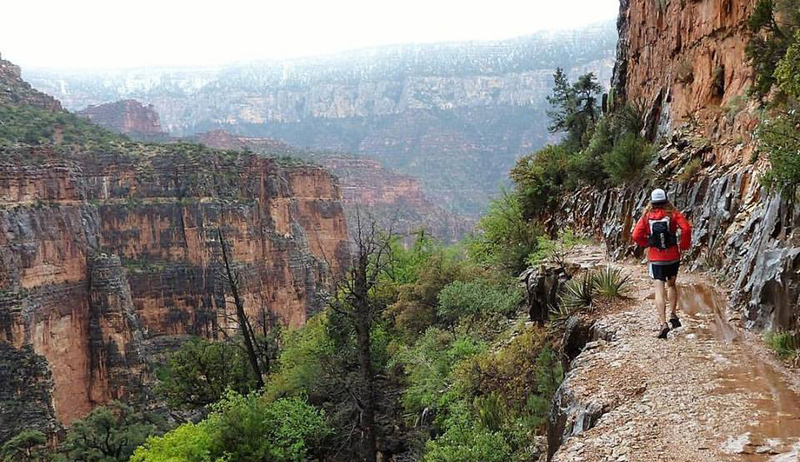 At 4:30 AM a handful of people in running packs shivered at the start of the South Kaibab Trail. We walked down the first switchback, cheered happy birthday to Tyler, and started running. Note: If you don’t like reading, you can stop here and just watch this 11 minute video of us running Rim-to-Rim-to-Rim. The start of R2R2R is always a bit of a bummer because South Kaibab is such a beautiful trail, but we cover most if it in the dark. Half way down the gray sky turned orange blue and the sun rose behind the clouds. Right on cue, the rain started falling, and didn’t intend to stop until the next day. We reached the Colorado River in 2 hours and crossed the bridge to take a quick break at Phantom Ranch. From there we wound through the box canyons and over the rolling hills of the North Kaibab Trail before doglegging west at the pump house, downshifting to the real work. 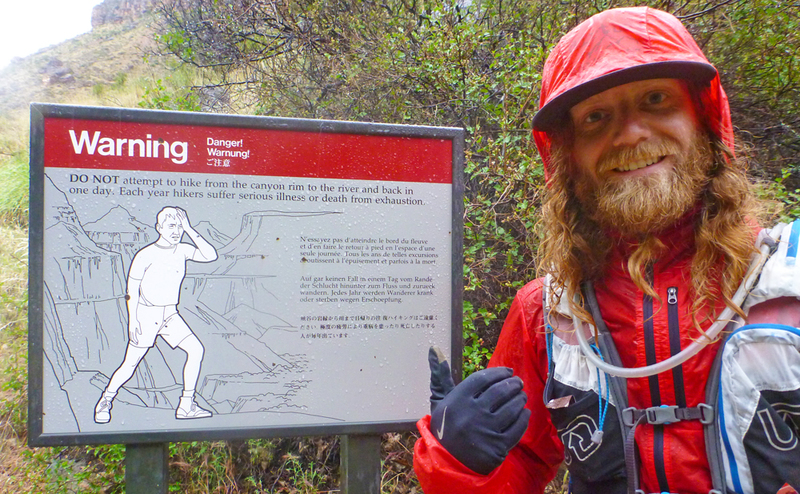 The next 5 miles were a grueling climb along steep cliffs with thousand foot drops, cascading waterfalls, and and sloppy trails soaked by rain. As we neared the North Rim the rain turned to sleet, and then snow. Every time I’ve been on the North Rim I’ve seen snow, but never this much. By the time we hit the turnaround sign the snow was falling hard and at least an inch had accumulated on the ground. It was beautiful, but we were wearing shorts and a light wind shells so we snapped a few quick photos and quickly turned to head back down the trail to lower, and warmer, elevations. It had taken 4.5 hours to climb to the North Rim and we made it back to Phantom Ranch in 3 hours. We sat for a quick break, refilled water, and strapped on our packs. As we were heading toward the Colorado River everything shook under a booming thunderclap, growing in magnitude as it reverberated off the canyon walls. We shot each other brief glances of understanding, knowing how miserable it would be to climb into a thunderstorm after covering 40 miles of canyon running. The only option though was push ahead, and the quicker we reached the top, the quicker we could get into dry clothes. Heads down, one foot in front of the other, minimal talking, we climbed. We crossed swollen streams, walking through water up to our calves, and trudged forward as rain saturated every layer we were wearing. After regrouping at Indian Gardens we made a final 4.5 mile push for the top. The rain had slowed a bit, but the wind picked up and any short break was quickly ended due to uncontrollable shaking from the bone chilling wind. Tyler and I crested the South Rim at 6:30 PM under gray skies and howling winds. We had completed the 47 mile run in 14 hours. Our friend Alex had finished as well and we huddled in a bathroom for warmth and called Dad to come pick us up, asking him to bring extra blankets. We waited at the rim as Dad and Kathy arrived and Stephen made his way to the top to be wrapped in a blanket. On the ride back to the campsite the temperature gauge on the truck read 39 degrees. Everything except my dry-fit underwear was soaked and I needed to get warm ASAP. 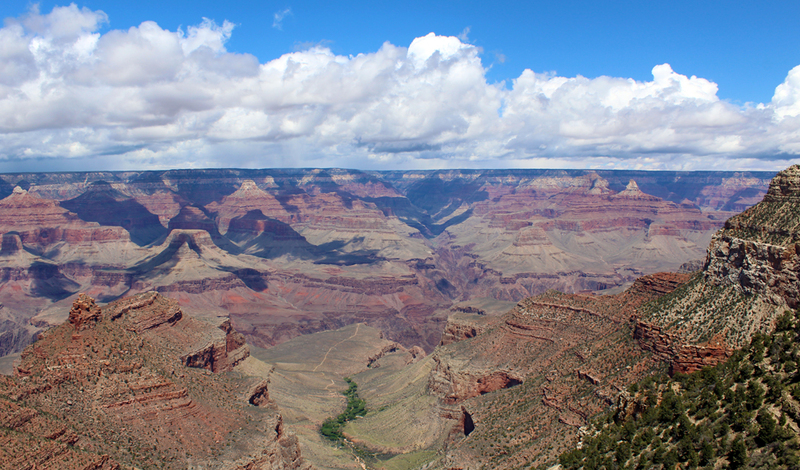 Warning: Do not attempt to hike from the canyon rim to the river and back in one day. If you are going to be stupid, at least try to go from rim to rim to rim. Back at the campsite I devoured a few slices of pizza and tried unsuccessfully to warm myself up by the fire. I knew from the Appalachian Trail that the only way to get my core temperature up was to get naked and climb into my sleeping bag. While everyone sat around the campfire drinking beers and celebrating the day I broke away from the group, got into my bag, and stayed zipped up for the next 12 hours. The next day we gingerly limped around camp as everyone packed and left to head for home. Aunt Karen and Uncle Jim brought Grandpa up and we all went to lunch together before Dad and Kathy took Grandpa back to Prescott. The campground was eerily quiet as Tyler, Stephen, and I spent the day sitting around the campfire drinking PBR and burning the rest of the wood. 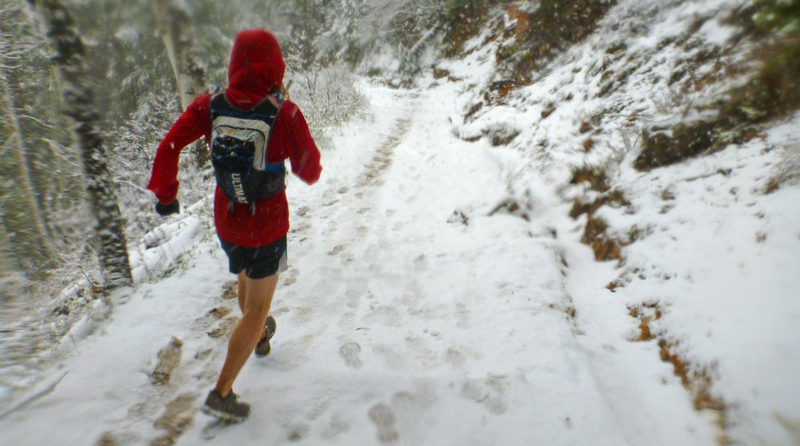 It was a beautifully sunny day and we all agreed that we’d rather have been running in the canyon in these conditions, but in retrospect, the best adventures come from the worst circumstances. It had probably been the second coldest I’ve ever been in my life (behind getting stuck on top of Mount Whitney for a night), but I wouldn’t trade all of the suffering, it made for a great story. Rim-to-Rim-toRim Round 2 was complete. We covered 47 miles, 11,000 feet of climb, from the South Rim to the North Rim and back to the South Rim in 14 hours and 3 minutes, 3 hours faster than we did it in 2014. Most importantly, it was another epic adventure with amazing friends and the perfect way to celebrate Tyler’s 30th birthday!